The new L131A1 standard sidearm of the British Armed Forces (aka the 32 yr old 9mm Glock 17). 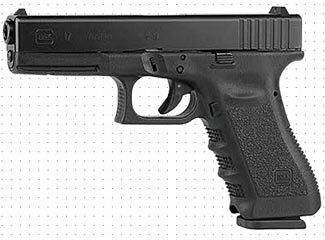 Are the FBI likely to also adopt the G17 next year, too? This week saw a watershed event in the never-ending debate about pistol calibers. But first, let’s put this week’s development into historical context and perspective. Until the 1980s, most police departments were issued with six round revolvers, usually chambered in .38 Spl or possibly .357 magnum. A few police departments were cautiously – indeed, hesitantly – experimenting with semi-auto pistols; in particular, early model Smith & Wesson semi-autos, chambered in 9mm. And, overlaying it all, particularly in departments where officers could choose their own handgun, there were .45 M1911 type semi-autos as well. The hesitancy on the part of police departments to shift from revolvers was due to several reasons. One of the more prominent reasons were a concern about reliability – it was felt that a revolver was close to 100% for-sure guaranteed to always shoot when called upon, whereas some of the early model semi-auto pistols were significantly less reliable, and in a typical close-range police encounter, the officer seldom/never has time to safely do a clearance drill if his weapon malfunctions at a critical point. Another prominent concern was a need for more hours of training for officers to become proficient with a semi-auto, and a related point was of safety – both for the officer and for the general public. All these pistols held relatively few cartridges, by modern standards. Early S&W Model 39 pistols held eight rounds, a standard M1911 magazine held seven, and of course a revolver typically had six (and some departments had a policy restricting officers to only having five rounds loaded, with the hammer resting on an empty chamber). The FBI mirrored the practice of most police departments and generally issued its agents with similar revolvers and occasionally semi-autos as well. In 1982 the winds of change were starting to blow, with Glock’s totally revolutionary design first appearing, although it took a while for this to start to have an effect in the US. Not only did the Glock have a new type of cocking mechanism and carry condition, but it also offered 17 round magazines. Prior to then, the highest capacity magazines were on Browning Hi-Power pistols, with 13 rounds. Both the first Glocks and the Hi-Powers were chambered for 9mm cartridges. It was not until 1986 that this slow-moving evolution of sorts switched to obvious and sudden change. This was the year of the infamous FBI Miami shootout, which saw two FBI agents killed and five wounded in an extended gun battle with two bank robbers. The two robbers also eventually died, but they each absorbed multiple hits and remained in the fight, continuing to effectively continue exchanging fire with the eight FBI agents, until finally succumbing to their wounds. This was a shocking outcome and caused a colossal re-think on the part of the FBI and law-enforcement in general – a re-think that was of course echoed by private shooters as well. New focus was given to ‘stopping power’ and the desire of ‘one shot stops’, as well as greater consideration attached to larger magazine capacities. After studies and stopgap temporary fixes, the FBI first settled on a 10mm cartridge as being the ‘ideal’ cartridge for their agents, and then after finding that the 10mm was ‘too powerful’ (ie too difficult to shoot well) they eased back a bit and determined the .40 S&W cartridge (which is basically a lower-powered 10mm cartridge) to be the ideal compromise, and designated the Glock 22 and 23 as the two official carry-pistols for their agents, in 1997. Police departments also started to rethink their standard sidearm issue, which both saw the end of revolvers, being phased out in favor of higher capacity semi-autos, and a shift up in calibers. While 9mm remained common, it was no longer as dominant as it once was. It was quickly decided that the earlier concerns were less important or could be resolved, as of course they could be and were. These days you almost never see any law enforcement officer with a revolver. While this was all happening, a surprising opposite transition was occurring in the US military, which after a lengthy evaluation decided in 1985 to replace their venerable M1911A1 pistols with the new M9 – a Beretta 92S-1 model double action semi-auto pistol chambered in 9mm, and with a 15 round magazine. This was a very controversial decision in every respect – the decision to go ‘down’ from a heavy big .45 round to a smaller lightweight 9mm round, and spurning the M1911A1 design and all American gunmakers in favor of an Italian made pistol. While gun owners might agree on many things, the one thing guaranteed to always cause an argument would be a discussion of what is the best handgun caliber. People would quote semi-scientific studies that could be selectively found to ‘prove’ just about any preference, and the conflicting moves of the military down-sizing to the 9mm while police departments were upsizing to larger calibers gave everyone plenty of ‘facts’ to prove whatever their personal preference was. But, and although it took decades to occur, a new perspective slowly emerged, and we’re now seeing a reversal of what has happened to date. As background to this, it is necessary to explain one very important fact. All pistol rounds are inadequate and unable to guarantee a significantly high level of one shot stops. The only difference between them might be shades of inadequacy, and the choices are not involved with finding the best caliber but instead with finding the least worst caliber. Recent FBI testing – well, a couple of years old now – has shown that the most important factor that corresponds to the effectiveness of any caliber is not the caliber itself, but the ability of the person using the firearm to shoot the pistol ‘well’ – ie, accurately (and, to a lesser extent, quickly, with second shots quickly delivered, also in a controlled well-aimed manner). This ‘discovery’ should astonish no-one, except the semi-skilled shooters who hoped they could find a ‘magic’ caliber cartridge that would excuse them the need to develop decent skills. Unfortunately, there is no such magic cartridge, and the bottom line shows that really there’s not much difference at all between any of the main pistol cartridges – the big difference is in the shooter, not in what he is shooting. That’s something that we’ve always agreed with ourselves. So, if the issue becomes one of shooting proficiency rather than cartridge effectiveness, which cartridge is easiest to master, and which cartridge can be carried in greatest quantity in any given size of pistol? The answer to that, as determined by the FBI research, is 9mm. The 9mm has the least amount of recoil and is the smallest ‘full size’ pistol cartridge. Typically a modern double-stacked pistol will carry two more rounds of 9mm in a given size magazine than it would .40 S&W. Some two years later, the FBI are finally putting their money where their mouth is, and this is reflected in their preliminary notice of an upcoming tender for 9mm pistols, published just this week. It is expected the formal tender will be officially announced probably during the first quarter of next year – clearly this is not something the FBI are rushing into! A move back to 9mm has already been occurring in police departments around the country. The .40 S&W round might have more energy and maybe even more stopping power, but it is harder to shoot well, and untrained shooters are more likely to flinch due to the greater muzzle blast and recoil, meaning that fewer of their shots land effectively on target. The appalling accuracy of police officers is the thing of legend throughout the firearms training industry (generally quoted as being around about 25%, depending on if you include such things as guaranteed single shot hits in police officer suicides), and part of the reason for this is that many police officers are not gun enthusiasts, and never use their firearms for recreation, and dread their annual or more frequent qualifications in their .40 caliber semi-auto. So if/when they ever need to use their firearm ‘for real’ they are poorly trained and their shooting reflects this. It is better public policy for police officers to shoot fewer bullets and more accurately. Here are just two examples (one two) where innocent bystanders have been hit by police fire – nine pedestrians in the first case and two in the second. With only one ‘bad guy’ in each case, it is beyond bad that an exchange of fire with a single gunman saw the police wound nine innocent civilians. 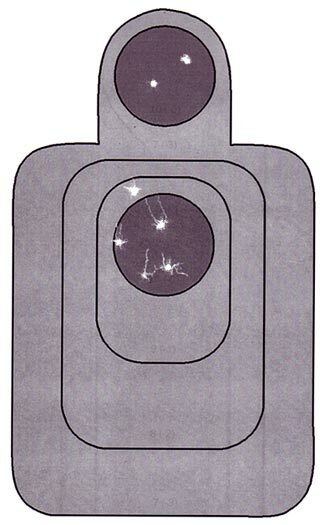 This is where better training with the 9mm might really pay dividends. If the police only fired eight instead of 16 rounds in the first of the two preceding examples, then clearly there’d be no way they could injure nine innocent civilians, and if indeed the 9mm round is less ‘lethal’ than a .40 caliber, the chances of fatal injuries on innocent bystanders also drops. The same issues apply equally to ourselves. Even if we train more rigorously than police officers, the additional overlay of adrenalin and fear will destroy much of the ‘skill’ we have calmly obtained in a relaxed safe training class at the local range, and we too may be wildly firing rounds everywhere except on target. Just like police officers and federal agents, we not only need good training but we also need a firearm that is easily controlled and operated. And, for 99% of people, no matter how well they say they can shoot a .40 caliber pistol, the chances are they can shoot the same pistol in a 9mm chambering even better and more effectively. The really amusing part of this story? At the same time that the FBI and many police departments are returning back ‘down’ to 9mm, the military is once more having another look at its M9 and considering a shift back to a larger caliber. Some special military units still use (or have returned to) .45 caliber pistols, but these units tend to be very highly trained, where the abilities of their personnel and their training more than compensate for any extra difficulty in controlling the higher powered pistols. But for your average infantryman who also seldom turns to a pistol, it remains unclear if the military will switch back to .45 or some other caliber, or stick with 9mm. We’re not saying that any pistol caliber is better than any other pistol caliber. Indeed, if we had to be pinned down to a statement, we’d say that all pistol calibers are bad, and we’d definitely say that you should spend your energy in training, not in seeking a pistol caliber that will spare you the need for training. But, having made that comment, we do agree with the new FBI finding that a larger number of well placed 9mm rounds will always be more effective than a smaller number of poorly placed larger caliber rounds, and we agree with their decision to return to the more easily handled 9mm caliber. Our favorite pistol is a 9mm Glock 17. 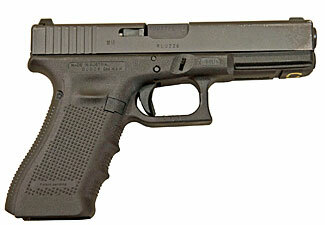 We also have Glock 19, 26 and 34 pistols, so we have all four of the double stacked Glock 9mm pistols. We do have other caliber pistols too – .40, .45, revolver calibers, and smaller semi-auto calibers too, all the way down to .22 and .32. We love our M1911 .45 semi-auto and sometimes carry it, but most of the time, our Glock 17 is our first choice. Our .40 (a Glock 22) stays in the gun safe and is never touched, other than for when demonstrating to friends why the 9mm is so much nicer and easier to control than the .40! We own other brands of 9mm pistol also, and have shot just about every major style of 9mm pistol. Some are nice and some are nasty, but no matter what else we sometimes trial, we always come back to our Glocks. As preppers, you want to have an ultra-reliable, easy-to-maintain pistol that uses a standard caliber of cartridge. Glock pistols chambered in 9mm come close to max on all three of those scales. Others might get close, but we feel that overall the Glock 9mm remains a prepper’s best choice. Please see our four part series on choosing a prepper pistol for a detailed discussion on the entire topic of how to find a suitable pistol. Is the Glock 17 the perfect prepper pistol? Read this four part series and decide for yourself? This is the first part of a four-part article series on choosing the ideal prepper pistol. After you’re read this first part, please do choose to click on to part two – Four More Selection Criteria to Choose the Ideal Pistol; part three – Caliber Issues When Choosing Your Pistol; and part four – Less Important Issues, and an Ideal Pistol Recommendation. Yes – we finally get around to suggesting an ideal pistol at the end of the fourth part of the series. Is there such a thing as an ‘ideal’ pistol for preppers? Many people think so, and at times vociferously express their opinions, but notwithstanding the apparent certainty with which some people answer the question, there is no clear consensus as to the ideal or best pistol for anything. Different situations require different pistols – that’s part of the reason why there are so many different shapes and sizes of pistols offered for sale. Choosing an ideal pistol is never easy, because any and all pistol designs are creatures of compromise. No pistol offers the accuracy or stopping power that would be ideal, and all pistols have to wrestle with trade-offs such as size and weight. So to evaluate your ideal pistol choices, you need to first identify the relevant selection criteria. We suggest that understanding your selection criteria and how possible pistol choices stack up against those criteria is an essential part of choosing an ideal pistol. So let’s look at the major issues that need to be considered when choosing a prepper pistol. We’ve come up with a dozen issues, and have ranked them in our suggested order of importance (as it relates to a prepping perspective). Certainly the issues should be ranked in different orders for different applications, and if you wish to change our order of ranking even for choosing an ideal prepper pistol, feel free to do so as you wish. For preppers, considering an uncertain future with the possibility of an extended time period of no external support – a scenario where ‘what you’ve got is all you’ve got’, we suggest the most important considerations are longevity, ease of maintenance, and reliability. At the other end of the scale, we suggest the least important consideration is price. You’re wanting a pistol that can be used for years and years, and for tens of thousands of rounds. Even if you never shoot more than a thousand rounds through the gun, and those all in a training situation on a range, you still want a gun that is a long-lived as possible, because WTSHTF you’ve no way of knowing when or if you’ll ever be able to get more spares for it. In a Level 3 situation, it might be a very long time before you can buy a replacement pistol if the one you have on hand fails, so you want a pistol that has as long a useful life as possible. In its ultimate sense, a pistol is like an axe. As you know, an axe is something that will last forever – sure, you occasionally need to replace the handle and sometimes the axe head/blade, but the ‘axe’ lasts forever. It is the same with a pistol – in theory you could replace every component as and when each part wears out, and one hundred years later still have the ‘same’ pistol, albeit with no remaining original parts and a new serial number on a new frame. When we talk about longevity we mean the length of time each of the components will operate before failing or becoming unreliable. For example, some springs are limited to only a few thousand cycles before needing replacement. Others are good for more than ten thousand cycles. Some frames are known to crack after only a limited number of full power or over-power rounds are fired, others last for very much longer. Some traditionalists still insist on disparaging polymer framed pistols. Maybe some ‘plastic’ guns might have had shorter lives than metal guns in the past, but these days, there is no indication at all that a high quality polymer framed pistol such as a Glock (which still has a metal slide, barrel and other stressed moving parts) has any shorter a life than any type of metal constructed pistol. If anything, the polymer seems to be at least as reliable and sometimes better than metal, which might crack or stretch or rust. There is a difference between longevity and ease of maintenance and reliability. A long-lived gun is not necessarily more reliable than a shorter lived gun, and may actually be harder to maintain, although generally a long-lived gun is also reliable and because of its ‘fault tolerant’ design, easy to maintain as well. These other two factors high priority factors need to be balanced out, but we suggest the most important feature, but only by a whisker, is longevity, although for sure the reliability issue is terribly important when you actually need to rely on the gun to function. In theory, anyone can ‘field strip’ a pistol because, by definition, field stripping is designed to be done, anywhere, by a gun owner/user, rather than by an armorer with special skills, and without requiring special tools either; indeed, most pistols can be field stripped with no tools at all (although sometimes you might need to use a bullet or other sure-to-be-on-hand improvised tool). When we refer to maintenance we don’t mean field stripping. We mean the ability to fully strip the pistol down to its 30+ individual pieces, all separated from each other – oh yes, and the ability to put it all back together again, fully functional, and with no mysterious pieces still remaining on the bench at the end of the procedure! A related part of maintenance is the ability to troubleshoot problems. If a pistol is ‘misbehaving’ it is important to first be able to understand what is causing the problem before, secondly, resolving the problem. You should get an armorer’s type manual for whatever pistol you choose, and if possible, attend a class in how to fully strip, repair, and rebuild the pistol. At the very least, search out some Youtube videos and disassemble and reassemble the pistol so you know you can. You should also get a full set of spare parts for your pistol, and two or more of any items that wear at an accelerated rate. Sometimes you can find suppliers that will sell a complete kit of commonly needed consumable items for a firearm – but if you buy one of these, don’t rely on it containing everything you need. These kits can sometimes include all the cheap parts, so as to create an impressive long list of included items at an appealing low price, but they omit the more expensive but equally prone to failure parts. Use such kits as a start towards assembling a full set of spares, but don’t consider them all you will need. There comes a point though where it may be cheaper to simply buy a second pistol – and that’s a perfectly valid option too. Beware of some firearm manufacturers who restrict the sale of some components to only certified dealers/armorers. In part this is a cowardly avoidance of probably non-existent liability – their lawyers have told them that if an ‘ordinary person’ tries to do work on their pistol and makes a mistake that results in a pistol malfunction (either discharging when it shouldn’t, or not discharging when it should – both are bad!) then the gun manufacturer/part supplier might be sued. So the gun manufacturer simply restricts the sale of such items to only certified professional gunsmiths. What use to you, longer term, is any firearm that you don’t have a full set of spares for? As soon as one of the items you don’t have a spare for fails, it becomes a paperweight (or, at least, a source of spares for other similar guns you might own). And Murphy’s Law – which will be working overtime after TEOTWAWKI – almost mandates that any parts that fail will be parts you don’t have. That issue also touches on the value in standardizing the weapons used among the members of your group. If you all use the same weapons, that means any of you are immediately able to competently use someone else’s weapon, and you need a smaller inventory of spare parts. This is an important topic we’ll write separately about on a future occasion. Make sure, the first time (and, ideally, every time) you fully strip and reassemble any firearm that you either have a knowledgeable friend double-check your work to confirm the pistol has been properly reassembled before then firing it, or at least that you do so yourself. Many pistols have a standardized set of safety/function checks you can and should do after reassembling it to help you confirm its return to safe operation prior to the first time you test fire it. The last thing you want is a pistol exploding in your face. Two sources of materials to teach yourself some gunsmithing capabilities are On-Target Productions (videos and printed manuals) and the American Gunsmithing Institute (a huge range of full teaching programs and videos). Reliability means that every time you want the gun to go ‘bang’ it will indeed do exactly that, with no jams or malfunctions. It also means that it will never discharge unexpectedly without your having pulled the trigger yourself. No gun is 100% reliable, and we include revolvers in that statement. Some people mistakenly believe that revolvers are 99.999% reliable, and so choose a revolver as being the most reliable pistol possible. Maybe we’ve just spent too much of our lives shooting firearms, but we’ve seen plenty of revolvers unexpectedly fail in the field. Pieces work loose, fall off, wear out of spec, or jam. Parts rust and corrode. Springs break. And so on, almost as much for revolvers as for semi-auto pistols. The reliability of any pistol should be considered under two categories – its ability to function without malfunctions, and its ability to function without jams. Most people use the terms interchangeably, but strictly speaking, a malfunction is considered to be an easily solved problem that you can fix in a few seconds in the middle of a gunfight (assuming you can spare a few seconds at such a time! ), whereas a jam takes the gun out of service until an armorer can take some time and tools to fix it. A jammed gun in a gunfight is a disaster, a malfunctioning gun is less serious (but still ideally avoided). It is true that revolvers malfunction appreciably less than semi-autos (ie almost never, ever), but they jam pretty much as often as semi-autos. Because most people don’t choose to distinguish between jams and malfunctions, they end up mistakenly believing that revolvers are 99.999% reliable both as measured by malfunction rate (a correct assessment) and by jam rate (a very incorrect statement). Furthermore, if you had to choose between a pistol that malfunctions rarely and almost never jams (a good semi-auto), or a pistol that almost never malfunctions but rarely jams (a good revolver) you should choose the gun that rarely malfunctions but never jams. A well maintained semi-auto, shooting a suitable choice of cartridge load (ie bullet shape and weight and neither too much nor too little powder/charge) should run 1000 and more rounds between malfunctions. As many as 5,000 rounds between malfunctions is not unheard of. Note that, with all pistols, some malfunctions are the fault of the ammo (such as primers not igniting) and, with semi-auto pistols, some other malfunctions are the fault of the shooter (‘limp-wristing’ the pistol rather than holding it firmly). In terms of jams, a well maintained semi-auto, and again with a suitable cartridge, should go more than 10,000 rounds between failures (the Beretta M9 exceeds 35,000 rounds before failure), and an occasional strip down, check, maintenance and repair of worn and soon to fail parts will extend that time still further. Our point here is that a modern reliable semi-auto is so incredibly reliable as to make it as close to the equal of a revolver as makes no practical or measurable difference. Bottom line? Don’t just rely on our uncorroborated statements. Look around you at professional gun carriers/shooters. What do they have in their holsters? You can – and should – join almost the entire world’s armies and police forces in trusting your life to a semi-auto. 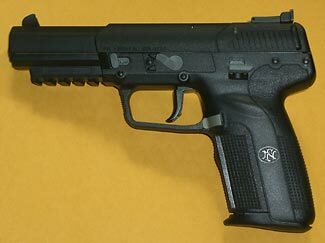 The FN5-7 is is a lovely ‘super-gun’ but look at all the controls on it, making it hard for normal people to become competent in its use. This is the second part of a four-part article series on how to select the ideal pistol for preppers. If you’ve directly arrived at this page, may we suggest you start reading from the first part – The Most Important Selection Criteria When Choosing an Ideal Pistol. Of course, when you’ve finished this second part, we hope you’ll move on to Part 3 – Caliber Issues When Choosing Your Pistol and then Part 4 – Less Important Issues, and an Ideal Pistol Recommendation. Your reward, at the end of the fourth part, is our suggested ideal pistol choice. In the first part of this series we suggested the three most important considerations in choosing an ideal pistol for prepper purposes is to select a firearm that has great longevity, is easy to maintain, and reliable in operation. Few people would disagree with the great importance of these issues. But what else also needs to be considered? Here are five more issues, in continuing order of decreasing priority, and – yes, we do expect some howls of protest at some of the comments we make! We’re giving more importance to this issue than you might expect, because in a survival situation, you want to have not just the gun enthusiasts and professionals in your group armed; you want everyone to at the very least be familiar with the basics of working a pistol (ie loading, charging, setting safety on/off, cocking/decocking, shooting, reloading, malfunction clearing, unloading) and hopefully to be comfortable, armed, whenever the situation calls for it (and, ideally, even when the situation doesn’t obviously call for it, too!). So a gun that is easier to learn and use becomes more important in this situation than it does when an enthusiast is selecting another gun to add to their collection, and welcoming the ‘fun’ of learning its associated manual of arms. Some pistols have seemingly dozens of levers and knobs and buttons on them. Others have almost none. Which do you think is the easier gun to learn to use? Yes, the one with few or no controls. You’ll find it very much easier to train people if you avoid pistols with safeties and cocking/decocking levers. We’ve lost count of the number of times we’ve seen new shooters get confused as to if their safety is on or not – with doubly tragic results. Some people will carelessly think the gun was safe, and then discover, via a negligent discharge, that it was not safe. Others will end up unable to shoot due to not understanding the safety was still on. As an interesting commentary on that second point, which sounds unrealistic, an after-batter review of dead US troops on the beaches of the D-Day landings found many with unfired rifles, but with broken triggers. Why were the triggers broken and the rifles unfired? Because the troops forgot to take the safety off, and in their adrenalin rush, didn’t realize what the problem was and simply pulled and pulled on the trigger until it broke. You need to realize that in high stress situations, the adrenalin dump anyone experiences will shut down their higher reasoning functions, leaving them only with muscle memory and instinctive learned actions. If you can make the muscle memory and learned actions totally simple, you don’t need to train your fellow retreat community members so much (and remember that some of your community will not like guns and won’t want to be trained anyway) and can still expect them to be able to ‘add value’ in a deadly encounter. One more thing about safeties. The most important safety is the ‘human’ safety – a total adherence to the four firearm safety rules is better than any number of mechanical safeties. For sure, revolvers are among the very simplest of guns to learn to shoot (but the very hardest to learn to reload). The next easiest to shoot after a revolver is probably a Glock or other double action pistol with no safety/decocker. If you’re going to have to use the pistol, you want to have as low a flinch response as possible. Maybe you, personally, are a super-macho type who doesn’t care how much blast, flash, noise and recoil the gun generates each time you shoot it, but your non-professional comrades definitely will be affected by such things. We’ve all seen new shooters tensing up, closing their eyes, then jerkily squeezing the trigger, with the shot going anywhere but towards the target. They hate the experience and shoot both more slowly and less accurately than they would with an ‘easier’ gun to shoot. The heavier the gun, the longer the barrel, and the smaller the caliber, the easier the gun will be to shoot. Some people also think the recoil on a semi-auto is easier to manage than on a revolver – the former is a sort of spongy springy experience, the latter is a hard sudden sharp jolt. Personally, we quite like the ‘clean’ feeling of a revolver recoil, but we understand the easier felt recoil of firing a semi-auto for many people. Note that we’ve put ‘comfortable shooter’ higher than caliber or accuracy or number of rounds stored. An easy shooting gun will be more effective, in the hands of an average or less than average shooter, than a larger caliber super-accurate huge capacity pistol. The unskilled shooter will shoot more accurately, and more quickly, with a ‘comfortable’ pistol than they will with a ‘super’ pistol, meaning they are more effective overall. As in every element of firearms skills, the key issue is almost always the person, not the gun. Design your firearms selections around the people who will be using them, not vice versa. We’re still not getting to accuracy, because most people don’t shoot very accurately – in a real confrontation – with a pistol. And when we say ‘most people’ we include trained professionals such as police officers, who struggle to land shots on opponents, in actual encounters, as much as a quarter of the time they shoot. It is one thing to shoot accurately at the range with an Olympic target pistol. But you don’t want a gun to win a gold medal at the Olympics with. You want a gun to save your life, and that’s a very different creature entirely. In a real encounter (especially in a lawless scenario where all usual behavior modifiers have been nullified), you want to be able to send a lot of rounds downrange, if for no other reason than to control the battlespace and keep the other guy’s head down while you decide what you want to do and how you will do it. We know that saying this will upset many traditionalists, who have been taught that accuracy is more important than any other element in a gun battle. Maybe – in an ideal world – accuracy is the most important, but we’re not considering ideal world scenarios, and neither are we considering perfectly trained highly skilled shooters. Indeed, in a Level 3 situation in particular, and lesserly in Levels 2 and 1, the precious scarcity of ammunition means that you’ll never be able to regularly train your people as often and extensively as you should, so you need to understand the compromises and considerations that become necessary. Of course, ammunition scarcity becomes a secondary issue when fighting for your life. In such a situation, your highest priority is to ensure your survival. Killing – or even wounding – your attackers is not as important as ensuring your survival, and conserving ammunition is hopefully the lowest consideration of all. Plus there’s a very good chance you’ll find yourself facing multiple opponents. Do the math : If you’re reasonably well-trained to the same level of competence as a police officer, that still means you’re only hitting your adversaries with one out of every four or five rounds fired, and if it requires three to five hits to take a determined adversary out of the action, how many rounds will you have to fire to stop three attackers? The answer is somewhere from a good case scenario of 36 rounds up to a bad case scenario of 75 rounds. Yes, that’s 12 – 25 rounds needed per person. Okay, you might get lucky and have a couple of single shot stops, but you might also get unlucky and need to pump ten rounds into a determined adversary before they break off their attack and either run away or collapse. Oh – and moving ahead of ourselves to the caliber issue, below, as well; that ten round requirement is as true with (your choice of good caliber) as it is with (your choice of bad caliber). Anyway, bottom line for this section should be obvious. No matter how many rounds your gun holds, the chances are you’re going to need to reload at least once during a real life encounter. Some guns are much easier than others to reload. Some guns have funnel-shaped entrances to their magazine well, and tapered off tops of their magazines (ie most dual stack magazines). Others have narrow magazine well openings, straight sided magazines, and tricky out-of-the-way magazine release levers. If you’re stuck with a revolver, then unless you are highly trained and practice regularly, you’ll find it takes ‘too long’ to reload after your first 5 – 8 rounds have been fired. Reloading a revolver also requires more fine motor skills than reloading a semi-auto, and the first thing you lose in a high stress adrenalin filled situation are fine motor skills. The low capacity and slow reload time add up to a total deal-breaker for revolvers. The more rounds per magazine, the fewer magazine changes you’ll need to do – that’s sort of obvious, isn’t it. Having more rounds in your gun also enables you to consider ‘suppressive fire’ – ie simply shooting in the general direction of the bad guys to keep their heads down and to prevent them from shooting back at you. The subject of magazine capacity is currently a matter of huge debate, with gun-control advocates seeking to limit the capacity of pistol magazines down to 10 or maybe even 8 or 7 rounds. Some pro-gun people have said ‘a trained shooter can change magazines in a second so the capacity issue doesn’t really matter’. It is true a trained shooter, with magazines properly indexed in magazine pouches on his belt, can indeed swap magazines in about a second or so; indeed, a super-trained revolver shooter can also reload his revolver in a similar time (but the big difference is that the revolver shooter is recharging 5 – 8 rounds whereas the semi-auto guy is recharging up to 20 rounds in the same or less time). But in a violent encounter, you may not have your spare magazine(s) in pouches on your belt, and wouldn’t you rather be shooting a half full gun than reloading an empty one? Plus, most people only carry one or two spare magazines. Wouldn’t you prefer those two spare magazines to have another 30 – 40 rounds in them, than to only have 12 – 16 rounds in them? So a gun with a larger capacity magazine capability is better than one with a lower capacity. This is the second part of a four-part article series on how to select the ideal pistol for preppers. If you haven’t done so already, may we suggest you next read the first part – The Most Important Selection Criteria When Choosing an Ideal Pistol. Of course, we hope you’ll also read Part 3 – Caliber Issues When Choosing Your Pistol and then Part 4 – Less Important Issues, and an Ideal Pistol Recommendation. Your reward, at the end of the fourth part, is our suggested ideal pistol choice. This is the third part of a four-part article series on how to select the ideal pistol for preppers. If you’ve directly arrived at this page, may we suggest you start reading from the first part – The Most Important Selection Criteria When Choosing an Ideal Pistol and then the second part – Four More Selection Criteria to Choose the Ideal Pistol. Of course, when you’ve finished this third part, we hope you’ll move on to Part 4 – Less Important Issues, and an Ideal Pistol Recommendation. Your reward, at the end of the fourth part, is our suggested ideal pistol choice. Nothing is a surer way to irrevocably change lifelong friends into forever enemies than to get into a discussion/argument with them about the ‘best’ caliber for a pistol. Pistols themselves are creatures of compromise, and the calibers they shoot doubly so. No pistol is as good as a rifle, and no pistol caliber is as good as a rifle caliber. As the saying goes – a pistol is the gun you use to fight your way to your rifle. Some people however cling to the belief that there’s a magic caliber endowed with special powers. There isn’t. These people are usually the people with ‘tricked out’ pistols with lots of accessories and gadgets, in an ever more desperate effort to avoid the one issue of paramount importance when it comes to effectively using any type of pistol, and of any caliber. What is that one issue (and why isn’t it on our list of twelve issues)? That issue is personal training. No amount of accessories, lasers, lights, sights, no caliber choice, nor anything else will compensate for simple basic training in pistolcraft. But, we’ve promised you a discussion on calibers, so here goes. The biggest problem surrounding discussions/debates/arguments about pistol calibers is that all pistol calibers are inadequate. None are good. All are bad, and as for some being less bad or more bad than others, it really doesn’t matter all that much. There is no ‘silver bullet’ caliber or cartridge that will guarantee one shot stops. It is silly to try to find a cartridge that will provide this; it is better to accept the limitation of all pistol calibers and to simply build that into your gun-fighting strategy, with an embedded understanding that you’ll always need to land multiple shots on any adversary to be sure of taking them out of the fight. The subject is surrounded with huge amounts of emotion, but extremely little truly meaningful scientific research. While some people will cite ‘studies’ in an attempt to ‘prove’ their opinion, there are so many variables associated with the effects of a person being hit by a bullet as to make all of these studies statistically insignificant and their conclusions invalid. A year or two back the FBI came out with a new study that reversed some of their earlier findings – the new study said that caliber was less important than shot placement. At last, they were apparently ending their hopeless question for the perfect bullet, and instead recognizing that the most important thing in a gunfight is not the bullets being fired, but the person doing the shooting. In other words, instead of going for the biggest badass bullet you can find, go for the one that is easiest to shoot. But if you want some scientific analysis, here’s a bit of simplified explanation. First, all pistol bullets are ballistically inadequate. Unlike high-powered rifle bullets, they travel too slowly to impart hypersonic shock waves into the target they hit. Hypersonic shock waves can scramble the internal organs of a person, and can even potentially travel up into the brain as well, and significantly increase the chance of a one shot stop, no matter where on the body your shot lands. But for pistol bullets, with negligible or no hypersonic shock effect, the majority of their lethality comes from hopefully damaging vital organs as they pass through the target. Now for the main point. There’s almost no difference in size between most common bullet calibers. The length of the bullets doesn’t matter much at all, the key measurement is their diameter. To make it easy to appreciate, let’s look at the diameter measurements in millimeters. A 9mm bullet is right around 9mm in diameter (as is, also, a .38 or a .357 cal revolver cartridge, and the .380 semi-auto cartridge too). A .40 cal is right around 10mm and so too is a 10mm round, while the .45 cal is just over 11mm in diameter (and a .44 magnum just under 11mm). So the biggest bullets are only 2mm – less than 1/10th of an inch – bigger in diameter than the smallest ones. See what we mean – bullet size is not as big a differentiator of different calibers as you might think. All pistol bullets are small, and even if they have expanding hollow-points which increase their effective diameter as they create a wound channel through a target, the respective size of the different calibers remains closely similar. So the statistical likelihood of the biggest bullet hitting a vital organ is only maybe 20% greater than that of the smallest bullet. A bullet’s weight and speed/energy is important if it hits solid bone – heavier bullets with more energy are more likely to break through the bone and continue traveling, lighter and slower bullets are more likely to be deflected or stopped by bone. On the other hand, a bullet being deflected off bone and ‘ricocheting’ internally in a person’s body might still do as much harm as a bullet going through the bone and continuing on out the other side. So it is probably fair to say that bullets with more energy are mildly better than bullets with less energy, but shot placement is always the overriding factor for effectively stopping an attacker. But if the bullet goes right through the body without encountering any bone, its weight and energy really counts for nothing. All you’ve done is drill a hole through soft tissue. Back to the FBI study, and remembering the inadequacy of all pistol calibers, the chances are that you’re going to need to shoot any attacker multiple times – or, to be more precise, you are going to shoot at the attacker many times in the hope of scoring several effective hits to take them out of the fight. You will achieve this goal – taking them out of the fight – more speedily with a caliber that you can more readily control, which has less recoil so there is less recovery time before your next shot, and more rounds landing on target, and more quickly. To give a ‘for example’, maybe in a given time frame you can fire six ‘easy to shoot’ rounds and score two hits, or fire four ‘hard to shoot’ rounds and score one hit. You’re getting twice as many rounds on target, and probably better placed on the target. Some adversaries will cease their aggression when they see your pistol. Others will cease when you shoot (even though you miss them). Others will cease as soon as they are hit, whether it be disabling/life threatening or not. Only a very few will continue to attack you after you’ve scored your first hit on them. So you want a pistol that looks ‘real’ rather than a toy to get the first category of people out of the fight, one which you can quickly deploy and credibly shoot, whether the round lands on target or not, to get the second category of people out of the fight, and one which will land rounds on the target quickly to get the third category of people out of the fight. As for the fourth category of person, you’ll want to be able to land multiple hits on the target as quickly as possible. All four of these needs argue in favor of the most controllable caliber, not the most ‘lethal’ (a concept which we don’t believe has any meaning with pistol rounds). If you’re looking for genuine one-shot stop capabilities, carry a rifle. In other words, for pistols, the best choice for your group as a whole is probably 9mm. No matter how much one attempts to belabor the point, many people will stubbornly claim, without a shred of evidence to back up their unchangeable opinion, that their preferred caliber is the best one out there. Can we offer a real-life example of how pistol calibers are inadequate. A police officer shot at an assailant 33 times (he only had 37 rounds with him), and very credibly had 14 of his rounds hit the attacker. Six of the shots were in locations normally considered as quickly fatal. And – get this, guys – he was using a .45 caliber pistol, almost certainly with high quality hollow point ammunition. But it was only after two head shots that the attacker stopped his attack. And even with his 14 injuries, six certainly fatal, the attacker didn’t die until some time subsequently, in hospital. So – 14 hits, six of them ‘high lethality’ placements, with the caliber that many people consider to be excellent at one shot stops. The bad guy wasn’t even on drugs, but was merely a determined opponent. Still feel good about your pistol’s ‘magical’ ability to solve problems? Note also what the police officer (a master firearms instructor and a sniper on his department’s SWAT team) learned from the encounter. He has replaced with .45 caliber pistol with a 9mm, so as to conveniently carry more ammunition. His conclusion is that more rounds of any caliber is the best approach to prevailing in future gunfights. You’d be well advised to consider a similar strategy. The alleged lethality of a cartridge is a minor issue, with controllability being a much more important issue, as we’ve just discussed. There are other issues, too. You want a gun that is chambered in a common caliber, one that is easy to source, likely to be sometimes offered in trade, even in a future adverse scenario, and one which is relatively inexpensive. Ideally it should also be a caliber that can readily and safely be reloaded, and one which is easy on the gun it is fired through. The very high pressures of the .40 cal cartridge disqualify it under these two parameters. Lastly, although we say that no caliber is good enough to guarantee one-shot stops, we will concede that some calibers are worse than others. Specifically, we suggest you do not consider semi-auto pistols in a .380 or smaller caliber, or revolvers in anything less than .38 caliber. Both 9mm and .45 cal are common rounds and well suited for personal defense. 9mm has the added advantages of being smaller, lighter, less expensive, and with slightly less recoil. Your gun, if chambered for 9mm, will hold many more rounds than if chambered for .45. So we’d generally recommend this as the best compromise caliber for your prepping pistols. But if you insist on a big caliber, we’d not stand in the way of you getting a .45 instead of a 9mm – we have both ourselves. This is the third part of a four-part article series on how to select the ideal pistol for preppers. If you directly arrived at this page, may we suggest you now read the first two parts – The Most Important Selection Criteria When Choosing an Ideal Pistol and Four More Selection Criteria to Choose the Ideal Pistol. Of course, we hope you’ll also move on to Part 4 – Less Important Issues, and an Ideal Pistol Recommendation. Accuracy is of course important, but is mainly dependent on you, not your pistol choice. This is the final part of a four-part article series on how to select the ideal pistol for preppers. If you’ve directly arrived at this page, may we suggest you start reading from the first part – The Most Important Selection Criteria When Choosing an Ideal Pistol and then the second and third parts – Four More Selection Criteria to Choose the Ideal Pistol, and Caliber Issues When Choosing Your Pistol. Phew. So far we’ve covered some obviously important issues, some moderately important issues, and we’ve tried to persuade you that something some people consider of great importance – caliber – is actually not as important as you might have thought. What else remains? Here are four more factors to evaluate when choosing your ideal pistol for prepper purposes, and then, finally, a suggested ideal pistol for you to adopt. How big and how heavy is the pistol? Pistols range in size and weight from tiny pieces weighing well under a pound and fitting comfortably into a regular pocket to massive monstrosities weighing well over three pounds. In general, bigger is better than smaller. But there comes a point where monstrously big starts to become a negative factor. Remember the primary purpose of a pistol is convenient portability – it is the ‘take with you everywhere’ gun. For a really effective firearm, you need to sacrifice convenience and instead choose a rifle. A larger – that is, longer barreled – pistol is slightly more accurate than a shorter barreled pistol, The extra barrel length allows the bullet to better stabilize and probably emerge at a slightly higher speed and with slightly greater energy. The extra barrel length also usually allows for a longer sight radius along its top – but note that accuracy is the second least important attribute we list for pistols. A heavier pistol has two possible advantages as well as the obvious disadvantage of extra weight meaning more hassle to carry, and we again restate that you should not try to over-engineer and over-specify what you expect in your pistol. A pistol is merely the gun you use to fight your way to your rifle – any real gun battle should always be conducted with a rifle, not a pistol. On the weight issue, the heavier the pistol, the less stressful the recoil will be. The weight of the gun ‘soaks up’ the recoil better in a heavy pistol than a light one. Many people misunderstand this and think small light guns are the easiest to shoot – that is completely wrong, but we’ve lost count of the number of times we’ve heard either gun buyers saying ‘I want a light easy to shoot gun’ or an advisor (often a husband or father) telling someone (ie a wife or daughter) ‘choose that one, it is nice and light and easier to shoot’. Secondly, a heavier pistol implies a pistol that has more metal in it, meaning less stress on the components because they are ‘over-engineered’ for greater life and reliability, and probably less sensitivity to individual cartridge configurations. This is sometimes the case, but also sometimes not (for example the Hi-Point pistols which have very heavy slides as part of their simple blowback mechanism). There’s one more thing about size. A ‘normal’ sized pistol (ie 4 – 5″ barrel) is intimidating and may solve a problem without needing to be fired. When a bad guy sees you confidently present your ‘normal’ pistol at him, he is more likely to back off than if you present a tiny little ‘pocket rocket’. A tiny 2″ barreled pistol looks much less mean and scary, and because of that, it is more likely you’ll end up needing to use it ‘for real’. Our feeling is that the intimidation factor is greatest with ‘normal’ pistols; if you have some ridiculous ‘tricked out’ over-size pistol, you start to look slightly foolish yourself and that also detracts from the overall ability of yourself to project a credible deterrent to whoever it is you’re encountering. So we’re suggesting pistols with a 4″ – 5″ barrel and probably weighing 1.5 – 2.5 lbs as being best all-rounders. Although we ourselves live most of the time in states where open-carry is lawful, we generally choose not to visibly open-carry our pistol(s). In the ‘normal’ world, open carrying can place the person with the pistol at a tactical disadvantage, and requires them to always be conscious of who is around them and to be ready to fight to control the retention of their pistol from unexpected attacks. It also shows any bad guys that you have a gun and where it is; you have no surprise factor at all in an encounter. One more thing – rather than encouraging people to be polite and well-behaved around you, it can actually incite some fools (usually drunk) to provoke a confrontation with you, and the question ‘So what are you going to do about it, Mr Tough Guy? Shoot me?’ is one we’ve heard expressed in such situations – situations where it would be totally inappropriate to present let alone fire your weapon. So, in the normal world, our preference is to carry concealed. That’s a whole discussion in and of itself, and may require some modifications to your choice of firearm. But in an extreme adverse situation in the future, maybe the need to carry concealed is no longer as strong, and instead the need to be able to quickly access both your pistol and your extra magazines is of greater importance. Maybe also, instead of potentially provoking encounters with people who know they can safely tease you with impunity, because if you as much as touch your pistol in a threatening manner, they’ll have the police lock you up so fast your feet won’t touch the ground (true); maybe in this case, in a situation where the rule of law has been suspended, people realize that it is an ‘every man for himself’ struggle, and that provoking a fight is more likely to create a tragic consequence for the provoker, and with no police likely to respond. So our feeling is that concealability will be much less important when TSHTF, and that instead you will want to carry your pistol in a way that you can most quickly get at it – in other words, a traditional vertical no-slope outside the waist-band holster, and ideally with an obscured retention device for the holster if you’re likely to be in areas with higher densities of people. By obscured retention device we do not mean an obvious SERPA style lock on the outside (away from your side) of the holster, and neither do we mean a strap with a snap catch over the top of the pistol. Instead, we suggest a lever device of some sort on the inside (close to your side) of the holster that people can’t see and don’t realize is there – a ‘Level 3’ type holster such as, for example, this Bladetech product. We imagine some people have already left this article, shaking their heads in disgust at our lack of respect for the ‘importance’ of accuracy. Yes, accuracy is important, but we place it in the second last position because almost any gun can outperform the person shooting it. The accuracy/inaccuracy of a good pistol (such as this lovely Wilson Combat) might be +/- one inch at 50 ft when fired from a bench rest (the Wilson claims one inch at 75 ft). But, in the field, with you shooting in a stressed situation, your accuracy will be +/- one foot at a 15 ft range (or maybe even worse). The gun is 40 times more accurate than the shooter. All accuracy is good, but any pistol that you’re considering is likely to have good accuracy to start with, and the path to better accuracy is not to buy a fancier more expensive pistol, but rather to train yourself to better use whatever pistol you do have. So, in case it is not obvious, we do agree that accuracy is essential, but the path to accuracy lies not so much in your choice of pistol as it does in your choice to train yourself to use it accurately. A factor which may impact on accuracy is the ‘ergonomics’ of the pistol. If the grip is too large (or too small) that might have a measurable impact, but in general, with standard sized name-brand pistols, they’ll all massively outshoot you when it comes to accuracy – maybe only slightly so on a range, but massively so in a combat situation. We’ve seen some people shoot well with one pistol and poorly with another, whereas other shooters have performed exactly the opposite. Note that such a wide and random spread of results generally occurs with inexperienced shooters – the better skilled you are, the less your personal accuracy will vary with your choice of pistol. A pistol is not designed to be an accurate weapon. If you want or need accuracy, use your rifle. Instead of being accurate to an inch at 50 ft, a good rifle is accurate to an inch at over 100 yards. Last, and truly least, price. Although we linked to a $3000+ Wilson pistol in the previous section, there’s almost never any need to spend over $1000 on a pistol, and many times you’ll find that $750 or less will be plenty to buy you the best possible pistol out there. For example, Glock 17 pistols are selling on Gunbroker.com for $600 or less, and some local discount stores may sell them for as little as $550. On the other hand, however, you have to wonder about guns that are ‘too low’ in price. There’s a sweet spot from about $500 – $1000 which allows a gun manufacturer to make a no-compromise pistol that will function reliably and well; if you pay less than $500, there’s a worry that some cost saving strategy might impact on the gun’s ongoing reliability; and if you pay more than $1000, well, good luck to you, but don’t assume that just because the gun costs more, it is any better than one costing less than $1000. Do you want to save a few hundred dollars on a tool that you’ll be trusting your life on? No, we didn’t think so! So, within the $500 – $1000 price range, focus on the gun and how it rates under the other 11 issues we’ve discussed on this and the other pages of this article series, rather than its price tag. But if we had to choose one and only one gun to take with us into a serious survival situation, a gun that we could rely on working, every time, for many thousands of times, we don’t need to think twice what our choice would be. By all the twelve measures above, we’d happily reach for our full size 9mm Glock 17 semi-auto. Sure, we’ve added night sights to it, and adjusted the trigger, but we loved it and won distinctions with it as a totally standard pistol with no work on it whatsoever, and we just love it all the more now that we’ve tweaked it a bit. Glock make four pistols in 9mm, and we have all of them (models 17, 19, 26 and 34). The 19 is slightly more concealable than the 17, and the 26 slightly more concealable again, but we’ve found that we can always conceal our 19 just as readily as our 26, so the 26 sits unloved in the safe. The 34 is a lovely gun, but somehow we find ourselves using our 17 as our ‘workhorse’ gun. The current model Glocks are termed the ‘Gen 4’ series (because they are, sort of, the fourth generation of Glock pistols), and when they first came out, they had reliability issues. But those issues have been resolved, although unfortunately they gave the Gen 4 series a bad reputation to start with – so bad that Glock decided to continue making the previous Gen 3 series alongside the Gen 4 until such time as the bad reputation faded. You’ll sometimes find people who don’t realize that the updated Gen 4 series pistols are now as ultra-extraordinarily reliable as the Gen 3 pistols, and they will try to talk you out of choosing a Gen 4 for that reason. Ignore them. Other people will say ‘The Gen 3 is cheaper’; and while that is true, you get an extra magazine included with the Gen 4 which helps to bridge the price gap, and it is an all-round better gun. As we said in the previous section, do you want to save $50 or less on a tool that you’ll be relying on to save you in an emergency? Of course not. In this extensive article series, spanning four parts and almost 8,500 words, we’ve looked at the issues that are relevant to you as a prepper for choosing an ‘ideal’ pistol. If you were a target shooter, you’d have different criteria, and you’d have different selection criteria again as a soldier or police officer. Our discussion is primarily for preppers. Realizing that there is no such thing as an ideal pistol (or caliber) and that all choices embody many compromises and limitations, we none the less end up with the conclusion and recommendation that you outfit your retreat community with Glock 17 pistols. This is the final part of a four-part article series on how to select the ideal pistol for preppers. If you directly arrived on this page, may we suggest you start reading from the first part – The Most Important Selection Criteria When Choosing an Ideal Pistol and then the second and third parts – Four More Selection Criteria to Choose the Ideal Pistol, and Caliber Issues When Choosing Your Pistol. 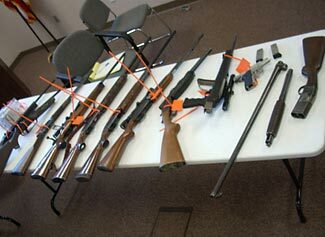 Please also see other articles in our Defense category and Firearms subcategory in particular. What Calibers of Guns and Ammo Should You Own? There’s a bewildering variety of choice of rifles out there. Which one(s) is/are best for preppers? One of the more polarizing aspects of prepping is that of firearms and their use, not just for hunting game but potentially for self-defense as well. Some avid preppers prefer to have no involvement with firearms at all, and concentrate more on eco-sensitive sustainable living. Others seem to devote most of their attentions to weapons and little to anything else. We suspect, and gently suggest, that the best approach lies somewhere in the middle between these two extremes. Like it or not, one of the preconditions for a Level 2/3 scenario is the failure of the rule of law, and if there is no-one else we can rely on to protect ourselves, our retreats, our stores and our families, we must be willing and able to do so ourselves. While there are plenty of pejorative terms that are used to describe the gun-enthusiasts, there’s also a term that can accurately be used to describe the people who prefer to have no contact with firearms at all – they can also be known as, alas, victims. In the lawlessness that will accompany a collapse of society, you must be prepared to protect and defend yourself, your loved ones, and your property, or else you’ll surely lose everything, having it taken from you by force. We wrote before on why preppers usually own multiple firearms, and a reader subsequently wrote in to list the firearms he owned himself and why. The reader referred to, more in passing than as a main part of his interesting commentary, owning some guns mainly due to the relative ease of finding ammunition for them as much as for any other reason. This is a key point which we felt deserved its own article, so – some months later – here it is. In an extended period of social disruption, it probably goes without saying that people will run out of ammunition. At the start of any period of social disruption, or just an increase in social anxiety and tension, you can expect to see ammo very quickly sell out in retail stores. Indeed, even now, ammunition is in somewhat short supply – there have been ammunition shortages for much of the last four years; sometimes extreme in nature and sometimes patchy – both due to greater levels of buying domestically and also due to all the ammo being consumed in our various foreign wars which have been making it hard for the manufacturers to keep up with demand. At present, ammo is getting in shorter supply again as people buy up prior to the November 2012 election – not due to any concerns about there being battles in the streets, but more due to concerns that if the present President is re-elected, he may act to restrict ammo sales. Need we spell out that ammunition is definitely something you should stockpile? It lasts a very long time (if stored in a cool dry environment, you’re probably looking at 50 years or more), and doesn’t take a lot of space. Ammunition will skyrocket in value as soon as social disorder strikes. It will become a valuable currency, although be careful who you sell bullets to, for fear of them being subsequently used against you! 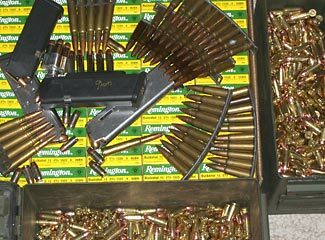 The chances are that sooner or later, no matter how much ammo you start off with, you’ll end up running low yourself; or alternatively, you might come across some good value way of acquiring more ammo. Other than to trade and resell on at a profit, ammo in a caliber that you don’t have any firearms chambered for is not very useful. So for that reason, it makes sense to have firearms chambered for the most popular types of ammo. That way, if you should come across a chance to pick up some more ammo on favorable terms, you can respond to the opportunity. Similarly, if you run out of ammo, then if your guns use a common sort of ammo, you’re more likely to be able to buy some more than if they use a really strange uncommon type of ammo. So, whether you want to have guns in common calibers to be able to use extra ammo if you have a chance to acquire some, or whether you want to have guns in common calibers to be able to get extra ammo if you need some, either which way, it makes sense to have a mix of different calibers among your firearms. Here’s what we recommend. And note that while we are talking about multiple rifles/pistols, we are not suggesting that you – as an individual – necessarily need to build up a huge arsenal yourself. Instead, we use the term ‘you’ to refer, in the plural, to yourself and the other members of your group/community. You should stock up on tens of thousands of rounds of .22 LR ammo, and have a range of rifles and pistols to shoot it. The stuff is extremely cheap, as are the guns that use it, and .22 LR ammo takes up close to no space at all. You can have ten times as many .22 rounds in the same space as you would ‘normal’ pistol/rifle ammo. You’ll use your rimfire guns and ammo for training, possibly for ‘warning shot’ type self-defense, and for controlling small varmints. You’ll not use these underpowered guns and ammo for ‘real’ self-defense however. There is only one caliber of type of revolver to have – ones chambered for .357 Magnum ammo. These will work perfectly well with both .357 MAG and .38 SPL ammo, which between them are far and away the most common/popular revolver ammo choice. The .357 chambered revolver gives you ‘two for one’ because it works with both types of ammo. We’re not suggesting you should stock .357 ammo in preference to .38 (most of the time we shoot .38 ourselves – it is cheaper and easier – less recoil – to shoot); we’re just saying to make sure you have revolvers that can accept either type of ammo. Sure, a .44 Magnum or larger handgun comes with a higher dose of testosterone, but the ammo is scarce and expensive to start with, and will only get worse in a situation where ammo is hard to find at the best of times, and the gun isn’t very comfortable to shoot. Furthermore, the .44 round isn’t really all that more lethal than a .357, and you can probably fire a .357 more accurately, definitely more comfortably, and more quickly than you can a .44 – in other words, you’ll get better results with the .357 than the .44. And while there are also many other calibers – both bigger and smaller than .38/.357, none of them are worth considering due to their relative rarities and lack of special benefits. Here you have more choices to consider than with revolvers. There are three main calibers in terms of popularity, which we’ll assess, more or less from most popular to least popular, as being 9mm, .45 ACP and .40 S&W. Our suggestion – concentrate on the 9mm pistols and ammo for them, but also keep a small supply of .45 ACP and .40 S&W ammo, and pistols to use them too. If you never need to use the .45 and .40 ammo, you can also use it as trade goods. We don’t want to get into a debate about which is the ‘best’ caliber and cartridge. You might believe that .40 or .45 cal pistols have more ‘stopping power’ and you might or might not be correct about that, although the most recent FBI studies are downplaying the importance of caliber entirely. They have found that the most important factor in stopping power is not bullet caliber but the rapid placement of multiple accurate shots. This is because all pistol calibers are ballistically ‘inadequate’, unlike most rifle rounds, they will stop an attacker only with a ‘lucky’ or a very well-placed shot. We’re simply saying that in terms of a pistol caliber when prepping for a troubled future, 9mm is the best choice, not only because of its ubiquity but also because it is smaller and cheaper than the .40 and .45 calibers, and has less recoil, making it more easily controlled and handled by all shooters. One more thing about these three calibers. By all means, get reloaded 9mm or .45 ammo, but be careful with .40 reloads. There is very little spare space inside the casing between the top of the powder and the base of the bullet, and if the bullet should be seated slightly too far, the pressures when the round is fired will be dangerously well in excess of what your pistol is rated to handle. The other large size caliber of note is 10 mm, but it has never become very common or popular. Ignore it. There are many other uncommon calibers too – ignore them all. Smaller sized calibers also exist, but most are too small/weak to be of practical use. The one debatable exception is .380 ACP, and over the last five years or so there has been a huge increase in the number of pistols being made in this caliber, due to people wanting smaller sized concealable carry pistols. You might want a smaller sized concealable carry pistol, in which case perhaps stock up with some .380 ammo as well as a pistol or two to use with it. But this isn’t a caliber that is ever likely to be a major caliber that you’ll use in great quantities – if you ever have to use your .380 it will be only to fight your way to safety or to a larger caliber gun. You’ll probably need more rifle caliber ammo than any other type of ammo (except perhaps .22 plinking ammo). This is because you’ll use your rifles for hunting and as your primary self-defense weapon. The number of rounds of ammo you’ll use for hunting won’t ever be too huge because hopefully you’ll typically be felling game at a rate of one animal per each well-aimed shot. But if you find yourself having to fight off repeated attacks from gangs of well-armed marauders, you could quickly go through hundreds or even thousands of rounds of rifle ammo in a single session – not because you’re being attacked by that many opponents, but because your shooting is now a mix of ‘suppressive’ fire (keeping the other guys away) as well as more careful aimed fire to actually score hits on the bad guys. There are three major military calibers – .223, also known as 5.56, .308 also known as 7.62×51, and 7.62×39. There actually is a slight difference between .223 and 5.56, and between .308 and 7.62×51, but for our purposes and with modern weapons, they can be considered more or less interchangeably. The 7.62×39 is the caliber that is used by the AK-47 and many other ‘communist’ bloc weapons (we use the quotes because most of these countries are no longer communist). It is hard to find US manufactured 7.62×39 ammo – all the stuff we’ve knowingly encountered ourselves has been imported, so our guess is that in a major breakdown of society, there’ll be little more 7.62×39 ammo coming in. For this reason alone we consider it the least favored of the three calibers; but having said that, there’s a huge inventory of this caliber ammo ‘out there’ at present. People buy it in quantities of thousands of rounds at a time, and many people have AK (and the earlier SKS) type rifles to use it with, so as a trading good, it would be sensible to have some ammo, and it would also make sense to have some rifles that can shoot it too. It seems that AK rifles are more tolerant of wear, damage, and dirt than are rifles chambered for .223 or .308. One other consideration with 7.62×39 ammo. Sometimes this ammo uses corrosive rather than non-corrosive primers, and we’ve heard, anecdotally rather than in our direct personal experience, that sometimes some of the ammo that is labeled as non-corrosive actually is corrosive. Just about all other modern ammo out there, these days, uses non-corrosive primers, and it is easy to get ‘spoiled’ and not be as diligent with cleaning as is essential when using corrosive ammo. If you are using 7.62×39 ammo, you will need to check to see if it is corrosive or not, and be more obsessive at cleaning your rifles. The .308 round is a great dual purpose hunting/self-defense round, and we recommend this become your prime hunting caliber, and that you get some ultra-reliable very accurate bolt-action hunting rifles that are chambered for .308 accordingly. The Remington 700 seems to be a well regarded rifle and is not unreasonably expensive. The .308 round is larger, heavier, and more expensive than the other two of these three calibers. It is also generally more lethal, and possibly superior in self-defense situations. So if you have a semi-auto magazine fed rifle or two in this caliber, that would be a good thing too. However, the same issues that saw the US Army and most other armed forces switch from a large-caliber round to a smaller caliber round apply with equal impact to you in your own self-defense requirements. Smaller lighter rounds are easier to carry and store (and less expensive to buy), and rifles chambered for this round are easier to shoot (lighter and less recoil). In most cases, the .223/5.56 is more than adequate for self-defense, although it is a less suitable round for hunting game. We recommend that the major part of your rifle ammo be .223/5.56 accordingly, and that you have a number of AR-15 type semi-auto rifles to use with this ammo. Now for a fourth caliber. Until 1957 the main rifle used by the US Army was the M1 Garand, and chambered for the .30-06 cartridge, a cartridge first released back in 1906 for the Springfield M1903 rifle, and in use pretty much continually ever since. Of all the ‘other’ hunting rounds (ie other than the .308) the .30-06 is far and away the next most common, due to its former military role. While the ammunition isn’t quite as common as the other three types, it is the next most common, and it would be wise to consider adding some type of bolt-action sporting/hunting rifle to your collection in this caliber, and keeping some .30-06 ammunition in your inventory as well. There are dozens of other hunting round calibers, but none of them are very common, and the same is true for the rifles in these other calibers. Sure, they are often excellent calibers/cartridges/rifles for hunting and self-defense, but you’ll find the calibers/cartridges/rifles you have in these ‘big four’ calibers are more than sufficient for all needs, with one possible exception – see the next section. There is one important caliber and rifle family that you might wish to consider if you feel you may need to protect yourself against para-military groups deploying lightly armored vehicles against you. That is the .50 BMG caliber, and some sort of rifle in that caliber to shoot it. A .50 BMG Barrett or other rifle is very expensive, and the ammunition is very expensive too – both will cost you about ten times the cost of an AR-15 clone and ammo to go with it. But having even a single rifle in this caliber and a few hundred rounds of ammo would give you a long-range stand-off weapon of stunning power and accuracy that could be used to keep bad people a long way away from you, and to punch through many types of cover to reach the bad guys sheltered behind. Barrett and the other specialty heavy-caliber rifle manufacturers also make rifles in other calibers too, but these calibers are very unusual and hard to come by. The .50 BMG is the most common of the heavy caliber cartridges out there, due to it being a military caliber cartridge used in various full auto military weapons. Everyone is familiar with the classic 12 gauge shotgun. There are other gauges available – usually smaller caliber gauges such as 16 gauge and 20 gauge and .410, and there are also larger calibers too – 10 gauge and 8 gauge. But we suggest you don’t get distracted, and stick to 12 gauge only. The smaller gauges (with the bigger numbers) are of little practical use, and the larger gauges (with the smaller numbers!) while being undoubtedly more powerful don’t really add much practical extra benefit in most normal situations. The 12 gauge is close to universal in application and ammunition for a 12 gauge is the very most common type of shotshells you’ll find. You’ll want to get some 00 buck shells and maybe some solid slugs for self-defense purposes, and birdshot shells in several different sizes for hunting birds (the smaller the bird, the smaller the size of shot needed, with – confusingly – the bigger the number of the shot type, the smaller the size of the pellets). Shotshells come in different lengths – longer shotshells have more space in them both for more shot and for more explosive charge. The 2 3/4″ length shell is the most common, but you should get shotguns that are chambered to accept 3″ shells too, so as to have more universal compatibility. If you really wanted to, it would be appropriate to get shotguns chambered to accept the rare 3.5″ shotshells – they will still work perfectly well with the shorter shotshells too, and gives you even greater compatibility with all types of loads you might come across. Most of the time, your self-defense weapon of choice will be your 5.56mm/.223 AR-15 style rifle, so you don’t need a lot of buckshot ammo for your shotguns. Get more birdshot for bird hunting than buckshot for self-defense. Your most important firearm in any Level 2/3 situation will be your rifle(s) – this is the best weapon for hunting with, and also for self-defense. Shotguns can be useful for shooting birds, and in very limited situations, for self-defense too. Pistols are of little or no value when hunting either game or birds, and are of minimal value as a self-defense weapon also, but they do have the benefit of being conveniently portable, so you’ll probably always have one with you, using it merely as a way to enable you to safely fight your way back into your retreat or to your rifle. In addition to the guns you know you’ll need and use, if money allows, it would be prudent to buy some spare guns in other calibers, just in case you should subsequently have a chance to buy ammunition in a caliber that you wouldn’t otherwise have any use for. If you were to buy only one gun, we’d recommend it to be a semi-auto .308 caliber rifle. But hopefully, just like you don’t only have one knife in your kitchen or one screwdriver in your toolbox, you’ll choose to get a broader mix of firearms to serve a broader mix of purposes. Because ammunition keeps a very long time, we recommend you keep a plentiful supply. How much ammunition - and how many guns - are enough? We received an interesting response from a reader on the subject of how many guns a prepper should own, and when does it become excessive. Here it is, slightly edited for form. Thanks for your article on why preppers usually include firearms in their preparations. Add all that up, and you’re looking at a total of not four or eight, but 16 firearms (and I’m not saying that is all I have, either). But does that make me a ‘gun nut’? 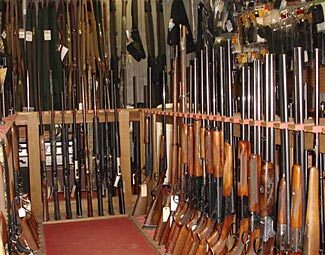 I’m not even sure what or who a gun nut is, but I do know that some people would consider having this many guns to be seriously threatening. It isn’t seriously threatening, it is just prudently preparing for a wide range of possible futures, especially to do with ammunition shortages. I also read your comment about duplicate guns in case of failures. That’s a good point – maybe I need to double up? And as for how much ammo to store, that’s a good question too! Anyway, thanks for the article. I hope my comments add further to the discussion. Why Do Preppers Have Guns? Why Do They Have So Many? The media love using pictures of seized 'gun caches' (which, by the way, are usually completely legal to own) such as this to vilify preppers and 'survivalists'. Note also how the shotgun on the right has been broken down to look like three different guns to the uninitiated. Being a prepper often attracts unfair negative media attention. Perhaps one of the reasons that the concept of preparing for disasters attracts so much automatic negativity is because non-preppers feel a semi-conscious mix of guilt and envy at seeing other people prudently preparing for emergencies. But rather than admit this truth, non-preppers seek ways to sneer at and denigrate their more prudent fellow citizens, and one thing which they love to attack is the fact that the preparations many people undertake involve – along with hundreds/thousands of other things – purchasing a number of firearms and a quantity of ammunition. Why do preppers usually own guns (and sometimes what seems like a ridiculous number of them)? Are they all gun freaks? Or is there a more logical reason? We suggest there are two reasons why preppers have guns. The first is to secure food by hunting, and the second is self-defense. If one is in some sort of circumstance where there is no food coming in to the supermarkets, what does one do? One does one of three things. The first option is the least appealing – one simply starves. And – yes, it is true one doesn’t need any firearms in such a case. To be blunt, this is the option that, like it or not, non-preppers risk if there is a major disruption to our food supply (although see the third option below for their other alternative). The second option is the most positive – one goes out hunting and fishing. For sure, fishing doesn’t require a gun, and again, for sure, growing fruit and vegetables doesn’t require a gun either, but raising fruit and vegetables is not something that you can instantly start any time you wish, and start harvesting food the very next day. Most crops are seasonal, and some trees take years to mature. Getting fruit and vegetables might take a year or more to come on-stream. Although fishing and growing crops does not require any firearms, hunting does. So, people who are anticipating the possibility of running out of food, or who wish to augment and extend the supplies they have stored, need firearms – and ammunition for their guns – to go hunting. Which brings us to the third option people have when they find themselves without food. This is one that, alas, many people will have no choice but to adopt. If they don’t have food, and if they have no way to hunt or otherwise gather food, and if they don’t want to just sit down and die, what will they have to do? Yes, they’ll attempt to take food from other people. And, in fairness, there’s no time for morality when a person’s life is on the line, is there, so one can understand why they would do this. Not only can one understand why people would do this, prudent people will also anticipate such occurrences and plan and prepare for them. Which puts the people who prudently prepared for food shortages in a difficult position. They probably barely have enough food for themselves – why should they have to share their food with the same people who formerly would jeer and sneer at them, and who refused to similarly stock up and prepare for future problems? This question is even more relevant and hard to answer if, by sharing their food, they then risk their own ability to survive in the process. Even in cases where people aren’t risking death by starvation and attempting to beg or take food by force, other ugly encounters are likely to arise. In any type of social disruption, looters quickly appear and seek to pillage and destroy property. Preppers become prime targets for looters as well as for starving people seeking food wherever they can find it. And – guess what. Most preppers probably don’t want to be victimized and to passively allow all their time, effort, energy and money invested in their preparations be destroyed or stolen from them. So – why do preppers have guns? Simple. For survival – both in the form of hunting for food, and in the form of self-defense. If you are preparing for such challenges yourself, you will quickly determine that you need to have more than one gun. You need two rifles for hunting – a small-caliber rifle for small game and varmints, and a larger caliber one for full size animals such as deer. You also might want a shotgun for ducks and other birds, and a pistol for convenient ever-present self-defense. Your shotgun and your larger caliber rifle would also be used for self-defense purposes too. So that is four guns for one person, as a minimum – and if you’re preparing for an extended period of emergency, you might want to double up in case a gun fails and needs to be replaced. So now we are looking at eight firearms for one person, and remember this is still a minimum quantity (even though it sounds like a huge number to some people). That sure sounds like a lot, until you understand the reasoning behind it. Guns are tools, with different guns being better for some tasks than others. For a comparison, how many knives do you have in your kitchen? All knives cut, just like all guns shoot. But different knives are better or not so good for different tasks, so a professional cook typically has a ‘set’ of many different knives, from tiny boning knives up to huge meat cleavers. Plus he has a few old knives that still stay in the drawer, even though they are no longer used, and he probably has a couple of other knives he bought but never uses because they weren’t as good as he thought they might be. It is the same with guns – indeed, it is safer to have multiple guns, because then you can best select the most appropriate gun for each task and use it most appropriately. So, if one person has eight guns (four main guns and four spares), how many for two people? Two people would want to have eight guns plus maybe just one (rather than two) sets of four spares – 12 guns for two people. Three people might call for 16 guns, and so on. Happily there is no law against owning multiple firearms and no restriction on how many guns anyone can own, so why not get as many as are prudently needed for a range of different future tasks. Next of course is the question of ammunition. Ammunition is small and compact so doesn’t take up much storage space, and lasts a long time (definitely in excess of ten years, usually in excess of twenty years if stored reasonably well) and is reasonably inexpensive. Ammunition is also an excellent trading good. If two people meet during an emergency, they might decide to swap things that they each respectively either have spares of and need some of in return, and ammunition in common calibers is definitely something that has huge value as a trading item in troubled times. So how much to store? That is one of the big questions preppers have to confront with everything they choose to stock up on, of course. In the case of ammunition, one single bullet might represent the ability to fell a deer, providing enough food for everyone present for a week, or to save a life in a confrontation, and by the same token, the lack of a bullet might mean starving or being overrun and subjugated by lawless marauding hordes of looters. Each of the four guns will require a different caliber of ammunition, and within that caliber, there will be a range of different bullet shapes, weights, and styles. It seems prudent to lay in a stock of some thousands of rounds of ammunition accordingly, in a mix of the four different calibers, and with a range of different bullet types (and shot shell types). Ammunition isn’t a large cost item, doesn’t take up too much space, won’t need to be thrown away unused due to short storage life, and is a key component of assuring the ongoing safety and survival of the group of people owning it. Are Too Many Guns Dangerous or Threatening? The media love to talk about ‘survivalists’ having huge caches of weapons and hundreds of thousands of rounds of ammunition as if this implies some degree of crazed intent on the part of the person owning the guns and ammo. There is an unspoken implication that a person with two guns is twice as dangerous as a person with one, and that a person with ten guns is ten times as dangerous. The same strange math is applied to ammunition – a person with 1000 rounds of ammo is ‘obviously’ more dangerous than a person with 500 rounds, and a person with 5,000 rounds is even more dangerous again. A person can only shoot one gun at a time, and the gun they are using can only shoot one bullet at a time. Having two or ten guns doesn’t make a person any more dangerous than having only one gun. If it did, our professional soldiers would be equipped with dozens of guns. Professional soldiers only have one or sometimes two guns (ie rifle and pistol); the same is true of most police officers too. If owning more guns did truly make a person more dangerous, maybe there would be laws against it. It is the same as cars and petrol, perhaps. A person can only drive one car at a time, and the one car he is driving only goes at a certain speed with a certain amount of power, no matter if the tank is full of gas or nearly empty. While guns hopefully and happily play a small part of our ordinary day to day lives, if there should be a disruption to our lives and the society in which we live, we may need to return to the ways of our forefathers and rely on guns more than we need to at present. Prudent people, preparing for possible problems in the future, will include guns in their preparations both for the ability to hunt food and for prudent self-protection. If you’re not a prepper, you have nothing to fear from preppers with guns. They won’t need to use them against you, because you, as a non-prepper, by definition, will have nothing they want or need. You should instead be concerned about other non-preppers with weapons, who might believe you have something they want or need, whether it be something essential for survival such as food and shelter, or something as irrelevant as a big screen television.